Phylogenetic relationships among extant ambystomatid salamanders summarized from Shaffer (1984), Shaffer et al. (1991) and Shaffer and McKnight (1996). Many relationships are very tentative because of conflicts among taxonomic characters, particularly in the clade shown as the sister group to Ambystoma californiense (A. tigrinum and related Mexican species, see discussion below). Two species, Ambystoma platineum and A. tremblayi, are chromosomal triploids originating from ancient hybridization between A. jeffersonianum and A. laterale (Hedges et al., 1992; Spolsky et al., 1992); because of the reticulate nature of their evolutionary origin, these species cannot be placed on a bifurcating phylogenetic tree. For more information about the extant incertae sedis species, see Frost (1985) and Duellman (1993). For more information about extinct ambystomatid species, see Estes (1981). 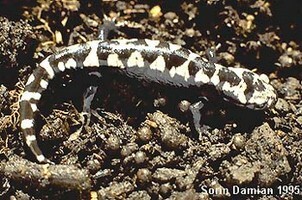 The genus Rhyacosiredon is shown here as it is traditionally recognized; however, because its recognition makes Ambystoma paraphyletic, some taxonomists synonymize it with Ambystoma. Salamanders of the family Ambystomatidae, commonly called "mole salamanders," are widely distributed throughout most of North America. Metamorphosed, terrestrial adults have robust bodies and limbs and short, blunt heads (Duellman and Trueb, 1986). They live under litter or in burrows on the forest floor and return to ponds or slow streams to breed. Aquatic larvae have broad heads, caudal fins and long filamentous gills (Duellman and Trueb, 1986). In most Ambystoma, including the widely distributed and familiar tiger salamanders (A. tigrinum complex), mating occurs during the early spring in ponds where the eggs are laid, often in visible clumps attached to submerged objects. Stages of embryonic development are often visible through the clear, floating eggs. Some species breed in autumn; these include the ringed salamander (A. annulatum) which deposits eggs in ponds, and the marbled salamander (A. opacum) which lays eggs on land in sheltered depressions that later fill with rainwater. Some ambystomatid populations are perennibranchiate, retaining into adulthood the appearance and aquatic habitat characteristic of larvae. The Mexican axolotls (A. mexicanum) are perhaps the most familiar example of salamanders that are permanently aquatic and larval in form. Other populations of ambystomatids may have a facultative metamorphosis, in which individuals have the developmental options of retaining the larval form into adulthood or undergoing a metamorphosis to a terrestrial adult form. The terms "paedomorphic" and "neotenic" often are used to refer to the perennibranchiate condition in ambystomatids. "Paedomorphic" is a general term that refers to any retention of characteristics normally associated with juveniles or larvae into adulthood. This term correctly refers to perennibranchiate ambystomatids but is not restricted to describing the perennibranchiate condition. "Neotenic" refers to paedomorphosis that arises developmentally by slowing the growth of organismal form without accelerating attainment of reproductive maturity. This term also correctly refers to many perennibranchiate ambystomatids but includes other phenomena, as does "paedomorphosis." Therefore, the term that refers most specifically to the retention of the gilled, aquatic larval form throughout adulthood in some ambystomatids is "perennibranchiate." Two ambystomatid species from eastern North America demonstrate the genetic and reproductive anomalies of chromosomal triploidy and gynogenesis, respectively. Ambystoma platineum is an all-female, triploid species containing two sets of chromosomes derived from A. jeffersonianum and one from A. laterale. Ambystoma tremblayi is an all-female triploid species containing one set of chromosomes from A. jeffersonianum and two sets from A. laterale. To activate development of their eggs, females of A. platineum mate with males of A. jeffersonianum, but the sperm make no genetic contribution to the offspring. Likewise, females of A. tremblayi activate development of their eggs by mating with males of A. laterale, but the sperm make no genetic contribution to the offspring. The ancient evolutionary origins of these genetically and reproductively anomalous species are analyzed by Hedges et al. (1992) and Spolsky et al. (1992). For discussion of additional discoveries of triploid unisexual Ambystoma formed through interspecific hybridization, see Kraus et al. (1991). Ambystomas figured prominently in early embryological experiments in which graft hybrids called chimeras were produced by transplanting embryonic tissue from one species onto the developing embryo of another species. The animals that resulted from these experiments were monstrosities that possessed the characteristics of different species on different parts of their bodies. This research is summarized in a posthumous collection of the lectures of Ross Granville Harrison (Harrison, 1969) and also by Twitty (1966). Harrison (1969) includes detailed drawings of the developmental stages of the spotted salamander, which he called "Amblystoma punctatum" and which is now known as Ambystoma maculatum. For many years, the tiger salamanders were considered a single polytypic species, A. tigrinum, that had the most widespread geographic distribution of any salamander species in North America. 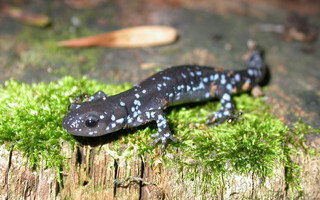 Molecular genetic studies (Shaffer, 1984; Routman, 1993; Templeton et al., 1995; Shaffer and McKnight, 1996) indicate that the tiger salamanders cannot be considered a single species and that the formally recognized subspecies may not be valid taxonomic units. Furthermore, A. tigrinum as currently recognized is paraphyletic with respect to numerous Mexican species, many of which are perennibranchiate forms having restricted geographic distributions. Evolution of perennibranchiate forms probably has occurred numerous times from within the A. tigrinum complex. Adults have robust bodies and limbs, broad and blunt heads with small eyes, prominent costal grooves and a laterally-flattened tail. Absence of grooves between the nostrils and upper lip distinguishes ambystomatid salamanders from plethodontid salamanders with which they co-occur. Aquatic larvae resemble adults except that they have filamentous external gills, four pairs of gill slits and their tail is more finlike. Larvae inhabit ponds or slow streams and usually can be found throughout the year. Some adults retain the appearance of the aquatic larvae; more commonly, adults are terrestrial, metamorphosed forms that live under cover objects or in animal burrows in the forest. The morphological characters given below are the ones standardly used to diagnose the salamander family Ambystomatidae and to assess its phylogenetic relationships to other salamanders. The individual characteristics are in most cases shared with other salamanders and should not be interpreted as synapomorphies of the Ambystomatidae. Absence of characteristics found in other salamanders is noted where it is important for distinguishing ambystomatids from other salamanders and/or determining their relationships to other salamanders. These characteristics were assembled from a large number of original sources by Duellman and Trueb (1986), Larson (1991) and Larson and Dimmick (1993). For a detailed description of characters variable within the Ambystomatidae and used to evaluate phylogenetic relationships among ambystomatid salamanders, see Kraus (1988). The premaxilla consists of separated, paired bones. Bilaterally paired nasal bones each ossify from a single, laterally positioned anlage; long posterior processes of the premaxillae extend between the paired nasal bones and completely separate them. Maxillary bones are present and well developed. Bilaterally paired septomaxillary bones are present. Lacrimal bone is absent. Quadratojugal bone is absent. Pterygoid bones are present. An internal carotid foramen is present in the parasphenoid bone in some species. The angular bone is fused to the mandible. The columella and operculum appear as separate ear bones detached from the otic capsule in some species, and the columella is fused with the otic capsule in others. Replacement of vomerine teeth proceeds from the posterior of the vomer. Teeth have a distinct crown and pedicel. Origin of the levator mandibulae anterior superficialis muscle includes the exoccipital. A basilaris complex is present in the inner ear. The recessus amphibiorum is oriented horizontally in the inner ear. The otic sac is multilobate, vascularized and filled with calcium. The amphibian periotic canal lacks fibrous connective tissue. The periotic cistern is large. The first hypobranchial and first ceratobranchial (alternatively homologized as the first ceratobranchial and first epibranchial, respectively) exist as separate structures. The second ceratobranchial (alternatively homologized as the second epibranchial) comprises a single element. The otoglossal cartilage is present as a semicircular ring in the hyoid apparatus of adults. Lungs and an ypsiloid cartilage are present. Larvae have four pairs of gill slits. The scapula and coracoid bones of the pectoral girdle are fused to form the scapulocoracoid. Vertebral centra are amphicoelous. Ribs are bicapitate. Spinal-nerve foramina are present in neural arches of all vertebrae except for spinal nerves exiting between the atlas and first trunk vertebra and between the first and second trunk vertebrae. Anterior glomeruli of the kidney are reduced or absent. Fertilization is internal. Ciliated epithelium is present in the cloacal tube and/or anterior cloacal chamber of females. Epidermal lining is absent from the anterior cloacal chamber of females. Evaginations are present in the dorsolateral walls of the male cloacal tube. Anterior ventral glands are present in the cloacae of females. Spermathecae are present in the female cloacal chamber. Glands secreting into the dorsal walls of the female cloaca are present. Anterior ventral glands are present in male cloacae. Posterior ventral glands are present in male cloacae. Kingsbury's glands are present in male cloacae. Dorsal pelvic glands are present in males. Lateral pelvic glands are present in males. Glands secreting into the male cloacal orifice are present. Parental care of eggs by females is observed only for Ambystoma opacum. The family Ambystomatidae contains only two extant genera, Ambystoma and Rhyacosiredon, with the latter comprising 4 species found in streams in the mountains of Mexico. Molecular evolutionary studies (Shaffer, 1984; Shaffer and McKnight, 1996) indicate that Rhyacosiredon is phylogenetically nested within the Ambystoma tigrinum complex. To avoid making Ambystoma paraphyletic, recognition of Rhyacosiredon has been discontinued by some authors and its four species added to the genus Ambystoma. The Ambystomatidae formerly contained the genera Dicamptodon and Rhyacotriton, both of which are now placed in their own taxonomic families (Dicamptodontidae and Rhyacotritonidae, respectively). Molecular phylogenetic studies show that Dicamptodon is closely related to Ambystoma and that these genera (plus Rhyacosiredon, if recognized separately from Ambystoma) together form a monophyletic group (Larson, 1991; Larson and Dimmick, 1993). Dicamptodon (plus extinct genera related to it) conceivably could be returned to the family Ambystomatidae and recognition of the family Dicamptodontidae discontinued. Rhyacotriton is only a distant relative of these genera, however, and should not be placed in the family Ambystomatidae. Some fossil vertebrae from the Upper Pliocene of Texas have been placed in the genus Amphitriton; otherwise, all known fossil ambystomatids belong to the genus Ambystoma (Estes, 1981). Five species (A. annulatum, A. barbouri, A. cingulatum, A. mabeei and A. texanum) have been recognized as the subgenus Linguaelapsus based upon characteristics of the skull and hyobranchial skeleton, although allozymic data have challenged the monophyly of this grouping (Shaffer et al., 1991). The ambystomatid phylogeny presented here is based upon a combined analysis of 32 phylogenetically informative morphological characters (Kraus, 1988) and 26 allozymic loci (Shaffer et al., 1991) as presented by Shaffer et al. (1991). (This analysis excluded Mexican species related to the A. tigrinum complex, whose relationships are based upon the allozymic data of Shaffer  and mitochondrial DNA sequences of Shaffer and McKnight ). The morphological and molecular data favor different phylogenetic topologies when analyzed separately and have been judged to contain significant phylogenetic conflicts (Shaffer et al., 1991). The tree shown here provides a useful working hypothesis of ambystomatid relationships based upon all data currently available, but it should be viewed as fairly tentative and in need of further testing. The nodes that appear most strongly supported by the combined analysis of morphological and molecular data include (1) the grouping of A. barbouri and A. texanum, (2) the grouping of A. annulatum and A. cingulatum, (3) the group containing A. barbouri, A. texanum, A. annulatum and A. cingulatum, (4) the grouping of A. californiense with A. tigrinum and its related Mexican species, (5) the grouping of A. gracile with A. maculatum and (6) the grouping of species comprising the subgenus Linguaelapsus (A. annulatum, A. barbouri, A. cingulatum, A. mabeei and A. texanum). All other nodes on the tree should be considered very tentative. Studies of A. tigrinum and related species from Mexico (Shaffer, 1984; Shaffer and McKnight, 1996) offer little support for monophyly of A. ordinarium, A. velasci, A. tigrinum or the subspecies of A. tigrinum. The remaining species in this group are mostly very restricted in geographical distribution and are represented in the study by animals from only one or two localities. The ambiguity of phylogenetic relationships among these species is presented as a star phylogeny with nine branches, shown as the sister group to a partially resolved branch containing 5 additional species. These molecular studies collectively indicate phylogenetic affinity among the species A. dumerilii, A. granulosum, A. lermaensis, R. altimirani and R. rivularis as shown, although some populations of A. ordinarium and A. velasci also fall into this group in the analysis of Shaffer and McKnight (1996). Only the monophyly of this entire complex of species and its placement as the sister-group to A. californiense appear well supported by the available data. Hedges, S. B., J. P. Bogart and L. R. Maxson. 1992. Ancestry of unisexual salamanders. Nature 356:708-710. Kraus, F. 1988. An empirical evaluation of the use of the ontogeny polarization criterion in phylogenetic inference. Systematic Zoology 37:106-141. Kraus, F., P. K. Ducey, P. Moler and M. M. Miyamoto. 1991. Two new triparental unisexual Ambystoma from Ohio and Michigan. Herpetologica 47:429-439. Routman, E. 1993. Population structure and genetic diversity of metamorphic and paedomorphic populations of the tiger salamander, Ambystoma tigrinum. Journal of Evolutionary Biology 6:329-357. Shaffer, H. B. 1984. Evolution in a paedomorphic lineage. I. An electrophoretic analysis of the Mexican ambystomatid salamanders. Evolution 38:1194-1206. Shaffer, H. B., J. M. Clark and F. Kraus. 1991. When molecules and morphology clash: A phylogenetic analysis of the North American ambystomatid salamanders (Caudata: Ambystomatidae). Systematic Zoology 40:284-303. Shaffer, H. B. and M. L. McKnight. 1996. The polytypic species revisited: Genetic differentiation and molecular phylogenetics of the tiger salamander, Ambystoma tigrinum (Amphibia: Caudata) complex. Evolution 50:417-433. Spolsky, C. M., C. A. Phillips and T. Uzzell. 1992. Antiquity of clonal salamander lineages revealed by mitochondrial DNA. Nature 356:706-708. Templeton, A. R., E. Routman and C. A. Phillips. 1995. Separating population structure from population history: A cladistic analysis of the geographical distribution of mitochondrial DNA haplotypes in the tiger salamander, Ambystoma tigrinum. Genetics 140:767-782. Twitty, V. C. 1966. Of Scientists and Salamanders. W. H. Freeman and Company. San Francisco, California. Sorin Damian, David Heyse, Todd Jackman, David Maddison and Christopher Phillips contributed to the preparation of this Tree of Life page.